I know that many of you in the US are feeling the effects of winter weather. I definitely am! My trip last week was full of snowy walk arounds, de-icing and really cold temperatures. So naturally, I found refuge in my stamp room and started thinking about spring. I’m so thrilled to share my first project as a design team member for Newton’s Nook Designs! I suspect that you can see exactly why I was drawn to this beautiful wreath from the Happy Little Thoughts stamp set! 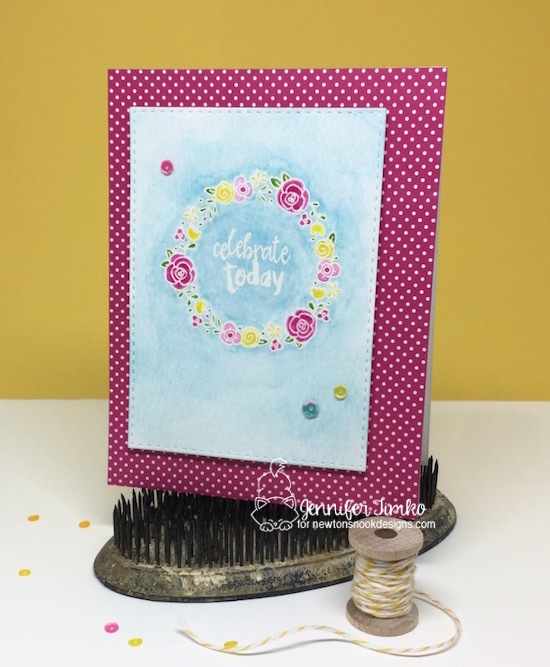 I just love the pretty little flowers and I chose this coordinating sentiment from the set too. It is meant to fit perfectly inside the wreath. I inked the wreath and sentiment with Versamark ink and stamped on Ranger Watercolor Paper. Then I heat embossed with white embossing powder. I colored the background and the wreath using Tim Holtz Distress Inks in Picked Raspberry, Squeezed Lemonade, Mustard Seed, Mowed Lawn and Broken China. It takes a little patience when you start since it is white embossing on white paper but just take your time. Totally worth it! I did a light layer of the blue (Broken China) around the edges of the wreath to start and then filled in the flowers and leaves a bit at a time. You will have to layer the colors to get them like you want them. Once I had the coloring right, I cut the image down using a Stitched Rectangles Die and added some sequins in coordinating colors. As a final pop of color, I layered the image on this pretty DSP print from Pop of Pink (SU). Coloring this definitely helped me chase away the winter blahs! I hope that you find a little bit of spring happiness today no matter what the weather is outside! Thanks for stopping in today. Back tomorrow with the latest from Freshly Made Sketches. See you then! And what for a project! No cat, but gorgeous! So cheery, Jen! Love your color choices. Thanks for sharing your techniques, too… I am sure I am not the only one that is captivated by the watercolor look. Take good care in the winter weather! Thanks for sharing your talent with us, and congratulations on being chosen for the design team… Very nicely done. This is such a cute card, Jennifer! Love it! This is such a pretty card, Jen! Love those colors so much !